For most people in Southeast Asia, when the festive season comes around it is an important time where traditions and family come first. Some look forward to spending time with their families; be it with a reunion dinner the night before Chinese New Year or by visiting other family members at their homes. For many others, it is the big Chinese New Year sales that they look forward to. Sales during festive periods is common in the region. You would not be able to miss the massive promotions retailers have in the lead up to widely celebrated holidays in the region such as Eidul Fitr and Christmas. Since the festive period is a time where many show-off new clothes or new furniture to their guests, most retailers and brands jump on this opportunity to boost sales. However, the patterns of consumption in the region are slowly shifting. Before this, Chinese New Year sales would result in hordes of people thronging shopping malls, causing massive traffic jams and parking headaches. For the past few years though, ever since online shopping and e-commerce websites popped up in the region, things have started to change. Many are opting to do their festive season shopping online. The penetration and popularity of e-commerce in the region has also led to the closures of some retail outlets. In Malaysia, another department store chain, Parkson, announced it was closing its three-level, 126,000 square foot Suria KLCC outlet after two decades of operations. Last year, the company closed a 220,000 square foot outlet in a busy downtown Kuala Lumpur mall where it was the anchor tenant since 2014. According to research by advertising company Criteo, there was a 35 percent uplift overall in daily online retail sales across Southeast Asia in 2017 around two or three weeks before Chinese New Year. Last year, Criteo predicted a boost across different shopping categories, with fashion experiencing a sales boost of up to 71 percent and food and groceries increasing up to 101 percent. Most of those sales were predicted to be done online. The shift to online shopping is not surprising considering the massive mobile internet penetration in the region. Growing incomes in the region too have also boosted the e-commerce market in Southeast Asia. With e-commerce becoming the preferred method of shopping these days, websites are offering discounts left, right and centre. Alibaba owned website, Lazada which operates in most Southeast Asian countries had a three-day sale with discounts up to 85 percent off. In Malaysia, Lazada Malaysia offered discount vouchers with a purchase of a minimum amount. 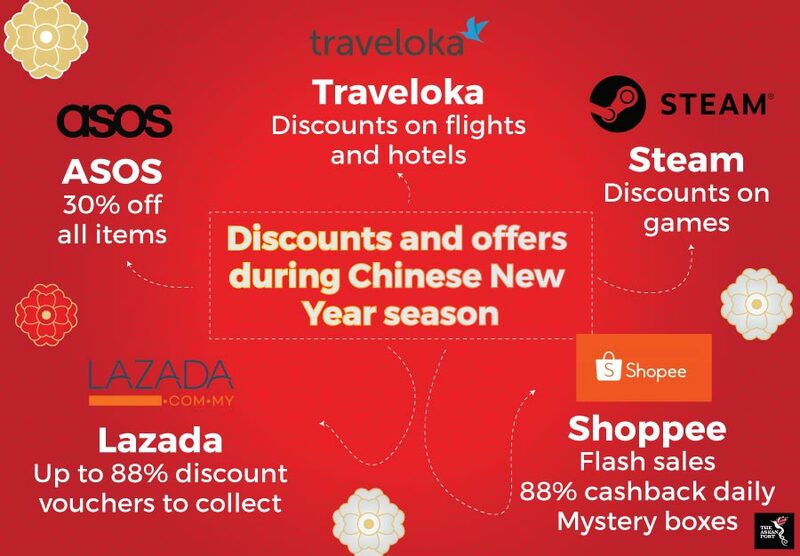 Lazada’s regional rivals, Shoppee also had massive discounts across their website. Throughout the sale period, Shoppee users could get up to 88 percent cashback daily using vouchers that were given out every day. It is not just regional websites that are jumping on the Chinese New Year bandwagon. International fashion retailer ASOS also offered Chinese New Year sales for customers around the region. Steam, a digital distribution platform for purchasing and playing video games also had discounts for games sold on their website. Travel websites are also cashing in on the Chinese New Year holiday period. Criteo highlighted that travel sales usually picks up two to three weeks before Chinese New Year. Figures show that three weeks before Chinese New Year there was an average increase of 33 percent in travel sales in Hong Kong, Taiwan, and Singapore. 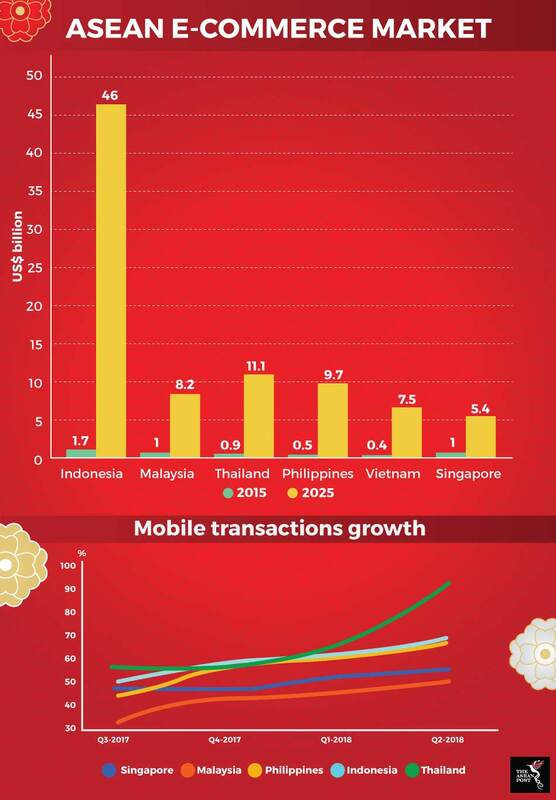 Evidently, Chinese New Year brings in wealth and prosperity for many e-commerce players here in Southeast Asia. Hopefully, the increased competition between these players will be a good thing for consumers as well.